BARBARA WALTERS: How did you capture that voice? So that it’s yours and hers and not just an imitation. MERYL STREEP: Well, Barbara, there are certain people in our culture…[who] have been imitated by everybody in the world. One of them is Julia Child, and the other one is you. 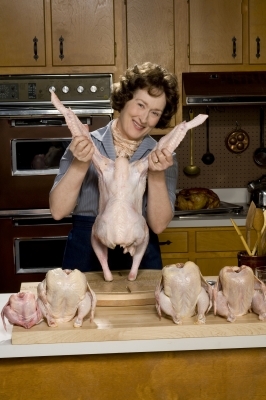 MERYL STREEP: We all have this memory [of Julia Child]. I didn’t have to learn it, it was already in my body. It’s not a thing that is forgettable. Because she was so distinctly and completely herself. Anyone out there doubt that Streep could do Walters’ voice better even than Walters does herself? I don’t.